Face it. We’re all in a bad mood sometime. Grumpy. Cranky. Oogie. And everyone has a different solution. Mine usually involves lots of See’s candy and reruns of Golden Girls. 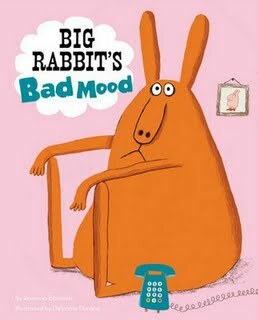 But for Big Rabbit, his bad mood is seemingly unstoppable. He tries eating chips (a tactic I’ve tried on occasion)…he tries making a salad (nope, that doesn’t help)…he tries watching television (apparently Golden Girls isn’t on)…he even tries doing something quite nasty with boogers. But to no avail. The bad mood just keeps coming and coming and there’s nothing that can be done about it. Even his friends can’t help – since they’re apparently all off doing wonderful things with each other. But when the doorbell rings, could Big Rabbit’s bad mood be a thing of the past? You’ll just had to read Ramona Badescu’s fabulous book and admire Delphine Durand’s utterly charming illustrations to find out.